It just snowed for 43 hours straight where I live, so you could say I have snow on the brain. So, when I was searching for a cute and whimsical winter wedding favor, it seemed only natural to find something the featured a snowflake. On their own, each snowflake is unique and beautiful (piled into two-foot high snowdrifts and it’s a different story). 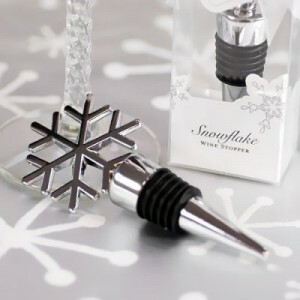 And this snowflake wine stopper is shiny and pretty and would be perfect for your winter wedding. The chrome wine stopper would be an ideal favor for your guests – made even more wonderful if paired with a small bottle of wine with a personalized label. They’re also affordable so you won’t break the bank or bust your wedding budget. Each snowflake wine stopper is individually wrapped in a gift box. The weather outside might be frightful, but your wedding guests will definitely think these wine stoppers are totally delightful. You can find these snowflake wine stoppers here.